In the magic and apocalyptic world of evangelical Christianity, God periodically gets really mad at the gays and sends a hurricane, or two. Interestingly, God’s anger patterns seems to reflect warming climate patterns. In the magic and apocalyptic world of evangelical Christianity, God periodically gets really mad at the gays and sends a hurricane, or two. After Hurricane Harvey ravaged Houston, many familiar faces in the far-right televangelist/talk radiosphere weren’t talking about climate issues; they were talking about Houston’s gay former mayor. Virulent homophobe and old Ted Cruz pal Kevin Swanson didn’t beat around the bush when talking about “very, very aggressively pro-homosexual” Mayor Annise Parker. Far-right Christian “activist” Dave Daubenmire appeared on the Pass the Salt webcast early this month and also declared that Harvey is God’s divine punishment for Parker. 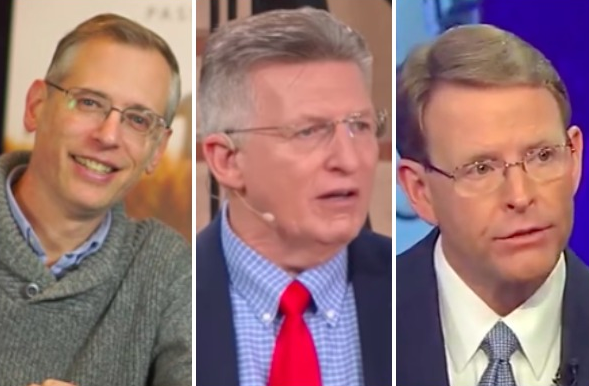 Another far-right Christian and conspiracy theorist, Rick Wiles, echoed the idea that the storms were the result of an increasingly gay-friendly world. “Here’s a city that has boasted of its LGBT devotion, its affinity for the sexual perversion movement in America. They’re underwater,” Wiles said, according to Reuters. A favorite example of how this sort of rhetoric can go wrong is Tony Perkins of the anti-gay Family Research Council. During flooding in Louisiana last summer, Perkins talked about how his home had been damaged, forcing him and his family to live in a camper for six weeks. Oddly enough, the previous year Perkins interviewed Christian “prophet” Jonathan Cahn,who claimed that Hurricane Joaquin was a sign of God’s wrath for the legalization of gay marriage. Perkins agreed, saying that while “those on the left like to mock these things,” many throughout history know “God is trying to send us a message” through natural disasters. The irony of Perkins almost losing his home in a flood a year later was not lost on many bloggers, including this one. While these stories are amusing, it’s important to remember that preachers with these very same views have the ear of President Trump. One who’s seemed to have a lot of White House access lately is First Dallas Pastor Robert Jeffress, who believes that legalized abortion led to 9/11. Even during George W. Bush’s time as president, anyone who came in his vicinity and spouted the notion that America deserved to be attacked on 9/11 would have been soon marginalized. Trump, and his followers, embrace them.